There is a Santa Claus. His Name is Bill Moore. At our National African American Parent Involvement Day on February 8th a parent suggested that we capture simple random acts of kindness. Here are a few of the great things that our volunteers have done to support our community. 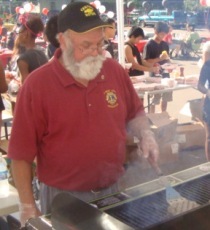 In 2008 Bill Moore the President of the Camden Lions Club President had a dream of establishing a student service feeder program into the Lions called Leos. He had worked at Patrick Henry as a assistant football coach and knew that Patriot students had a zeal for helping other. Mr. Moore worked on the Leos program and grew it successfully until it has become one of Patrick Henry's most popular student activities, and certainly THEE most prosperous student activity having raised several hundred dollars for local charities since its inception. Mr. Moore even brought his daughter to help with the setup and takedown of the chairs, tables, and tent.The end result was one of Patrick Henry's most popular events of all time, serving over 1,000 staff, students and their families. All agreed that this event could not have been possible without Mr. Moore.